The following outlines the details of a job removing and replacing hazardous asbestos-containing refractory material from a boiler at a major industrial power facility in Canada. Remove and replace existing refractory with respect to reducing hazardous airborne contaminates. Remove asbestos containing cement material and replace with mineral wool insulation to existing boiler buck stays at a major industrial power facility without having the boiler shutdown. 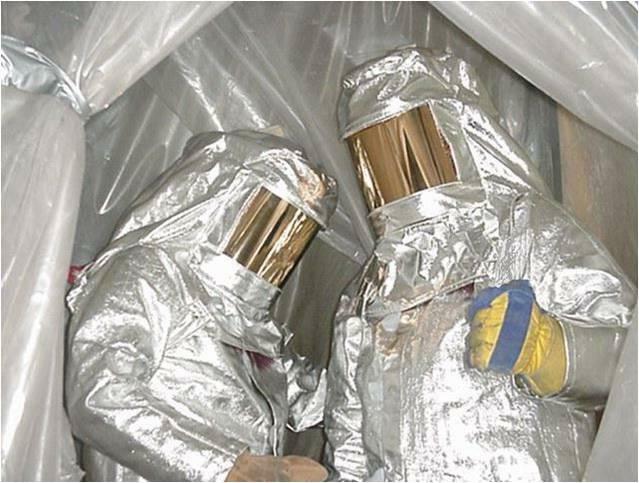 Construct approx 26,000 square feet of fire rated shrink wrap hoarding c/w decontamination facility to allow for high risk, hot removal of asbestos insulation from Buck Stays. Shrink-wrap consisted of fire rated, 9-mil thermo plastic high strength polyethylene. Workers were equipped with all the latest state-of-the-art body cooling equipment & PPE and worked to a threshold limit - value % work.